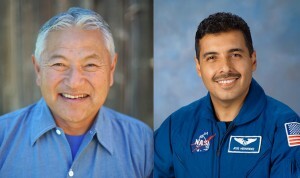 MERCED — Acclaimed author and organic farmer David Mas Masumoto and retired NASA astronaut Jose Hernandez addressed UC Merced’s Class of 2013 at commencement over the weekend. The campus marked its eighth commencement with two ceremonies to accommodate the growing number of graduates. With more than 900 students eligible to graduate, this year marked the largest graduating class in UC Merced’s history. This year’s graduates hail from 42 counties in California, four other states and four other countries — China, India, Japan and Malaysia. As a result of such growth, the campus planned two school-based ceremonies to accommodate students and their families. Hernandez spoke to candidates in the schools of Natural Sciences and Engineering on May 18, and Masumoto spoke to candidates from the School of Social Sciences, Humanities and Arts on May 19. Both events were held in the South Bowl on campus. A child of migrant farm workers, Hernandez didn’t learn to speak English until he was 12 and worked hard to overcome language and cultural barriers to graduate from high school. He joined NASA in 2001 as a materials research engineer at Johnson Space Center. He was promoted to Materials and Processes Branch chief in 2002 and served there until he was selected as a NASA astronaut in 2004. During the STS-128 shuttle mission in 2009, he was responsible for transferring more than 18,000 pounds of supplies and equipment between the shuttle and International Space Station and assisted with robotics operations. He also served as a flight engineer in the shuttle's cockpit during launch and landing. He retired from NASA in 2011. Before working for NASA, Hernandez helped develop technology for present-day mammography machines while he worked at Lawrence Livermore National Laboratory. Hernandez, from Stockton, holds a bachelor’s degree in electrical engineering from the University of the Pacific and a master’s in electrical and computer engineering from UC Santa Barbara. A third-generation farmer, Masumoto grows organic peaches, nectarines and grapes for raisins on an 80-acre farm in Del Rey. He is a columnist for The Fresno Bee and a regular contributor to The Sacramento Bee. He has written for USA Today and The Los Angeles Times. He has authored several books, including “Four Seasons in Five Senses,” “Letters to the Valley,” “Harvest Son,” “Epitaph for a Peach” and “Wisdom of the Last Farmer.” In 1995, “Epitaph for the Peach” won the Julia Child Cookbook Award in Literary Food Writing category and was a finalist for the 1996 James Beard Foundation Food Writing Award. It received the San Francisco Review of Books Critics Choice Award in 1995-96. Masumoto received the Award of Distinction from UC Davis in 2003 and the California Central Valley Excellence in Business Award in 2007. “Wisdom of the Last Farmer” was honored as Best Environmental Writing in 2009 by the National Resources Defense Council. Masumoto serves on the board of the James Irvine Foundation, the Public Policy Institute of California and the National Council on the Arts. He served on the California Council for Humanities, California Tree Fruit Agreement Research Board, Raisin Advisory Committee Research Board, and California Association of Family Farmers. He has a bachelor’s degree in sociology from UC Berkeley and a master’s degree in community development from UC Davis, and attended International University in Tokyo.